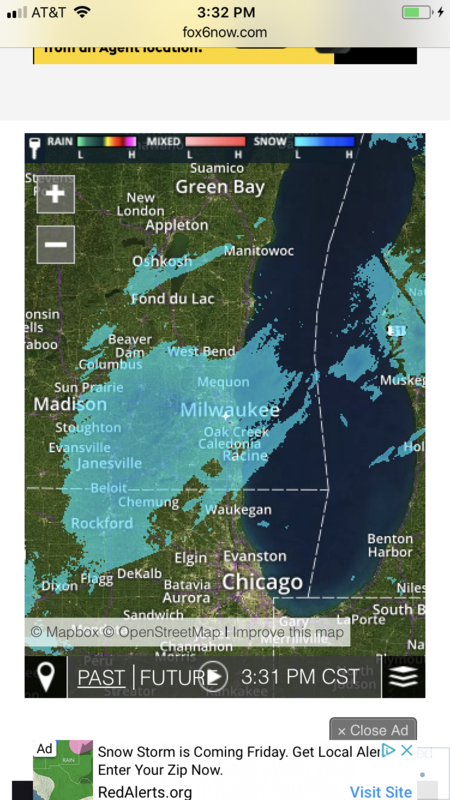 Any Milwaukee School of Engineering graduate can tell you this: MSOE never closes for winter-related weather issues. I’ve taught there since 1996, and although we closed early a few times (no classes after 3:00 p.m.), the only time I can actually remember closing for snow was after the blizzard that struck the day after New Year’s Day in 1999. Snow began falling last night and it’s still falling now. It’s supposed to continue till around 7 p.m. tonight. We went out and did one round of shoveling for a few hours earlier today. Round two can wait until it has finally stopped snowing. Here’s the radar around 3:30 p.m. 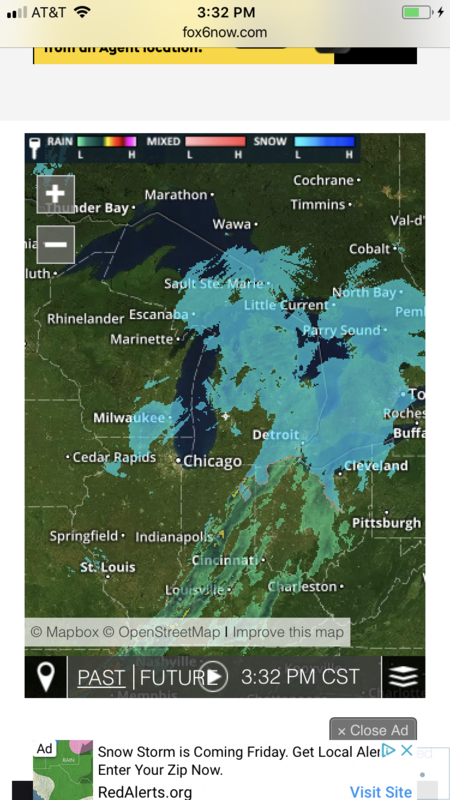 Still lots of snow waiting to pass over us. And here is the larger view, just to show the storm that has already passed eastward. We live in an older inner-ring suburb of Milwaukee, a city originally settled almost two-hundred years ago and only gradually becoming a seamless part of the overall Milwaukee metro area. Lots are larger than Milwaukee’s city lots, but way smaller than newer suburban lots farther out. Our driveway is long, running beside our house from the street to the detached garage at the rear of our lot. Our yard is fenced (dogs) and a large gate crosses the driveway at the rear of our house. We have three vehicles in our family (mine, my husband’s, and my older daughter’s), none of which is ever parked in our one-car garage, mostly because opening and closing the gate is awkward and time consuming. All of this is fine . . . until it snows. Then we have to clean off the cars, one by one, parking each in the street when it’s done so we can then back the next one down our long, skinny driveway to the sidewalk end, where we have enough room to brush the snow off. There’s no room farther up the driveway because it runs between our house and the neighbor’s garage. And it’s not just brushing the snow off of each car. First we have to clear away the snow between the street and the closest vehicle. Then we back up that car and clear the snow. Put that car on the street (which hopefully has been plowed, and the city has been doing a great job of that in recent years, THANK YOU!!!) and then shovel between where the first car was and where the second car is. Back that car down the driveway to the sidewalk and brush it off. Put it on the street. Shovel our way back to the third car. Back that car to the sidewalk and brush it off. Pull all the cars back in, and now go around to the backyard to clear everything from the garage up to where the third car is parked. Today my husband and daughter were shoveling and using the snowblower on the back end of this equation, while I worked alone out in front. Something about city lots that you might not think of if you’ve never had to do snow removal on one is that you quickly run out of places to put the snow. After the first snowfall, we’re fine. But after several significant storms, all the space near the driveway is taken up by ginormous snow mountains. So then we need to shovel or blow the snow up the sidewalk to the area of our yard farthest away from the drive. And that’s where I was earlier today. I’d get a shovel full of snow from our driveway, then walk up our sidewalk about two-thirds of the way to the next house on the street. Dump the snow on our front yard there, where the snow piles haven’t yet grown into mountains. Turn, with the now-empty shovel carried loosely across my body, to stroll back down the sidewalk to our driveway, where I’d get another shovel full of snow and carry it up the sidewalk to dump into the emptier area of our front yard. Those return strolls are peaceful. Because I’m not using a snowblower, there’s no noise. I can look around at the snow silently falling and appreciate how beautiful it looks covering the branches of our birch in silver-white strips or bowing with the weight of fluffy white the evergreen branches of the tall yew that anchors our front porch. This afternoon the thought occurred to me during one of my return strolls that I was a lot like Camus’ Sisyphus. Have you ever read that essay? Here’s a link to the Wikipedia entry on it. Basically Camus uses the Greek myth of Sisyphus (and here’s a link to the Wikipedia entry on that myth) to make a point about the absurdity of life and what makes it worth living when it’s all so pointless. If Sisyphus spends an eternity pushing his rock up a hill for no reason, never getting anywhere, never accomplishing anything, then what’s the point of his life? Why continue living? And Camus says: because after Sisyphus has reached the top of the mountain only to see his rock tumble back down to the bottom, he has to make a return trip to the foot of the mountain to start pushing the rock uphill again. And during that walk back down the mountain, Sisyphus is able to have some time to himself, temporarily released from the burden of his endless task and given a chance to reflect and enjoy his surroundings. He is at peace. The older I get, the less sustainable this snow-removal routine becomes. Plus, the day will come when neither daughter is here living with us to help out. I know something has to change. Maybe we need to replace our one-car garage (original to the nearly 100-year-old house) with a two-car garage. Maybe we need to move, either to a condo/apartment (with no shoveling needed) or to a house farther out (with loads of room on either side of the driveway to blow the snow; just zip, zip, zip up and back with a snowblower). This entry was posted in Life, Milwaukee, Nature and tagged Camus, happiness, Milwaukee, Myth of Sisyphus, shoveling, snow, snow day. Bookmark the permalink. Ahh, snow! As a fellow dweller in a snowy clime, I understand where you’re coming from. I do love the beauty of snow, and my school never closes for a snow day either. We have managed to outsource our shovelling to our 12 year old neighbour, a resourceful young man who hires himself out for raking, snow shovelling, and dog walking. You are so fortunate in your young neighbor! He has a bright future. The students at my school are well known for their work ethic. Many of them also had small businesses in their teens doing landscaping, snow removal, etc., for their neighbors. Just plenty of cheerful, old-fashioned “hustle”! I went out to shovel out at the condo today, mostly so our dog would have a place to do her duty (short legs, don’t cha know). When I came in, Becky looked up in surprise. “Done?” she said. “Yup,” I said. “It used to take you hours in Milwaukee,” she said. “Yup,” I said, “And that was with a snowblower.” We both were quiet contemplating our new-found freedom from the toils of Sisyphus. I envy you. I just took a look outside this morning and found that the plows had done their work at the bottom of our driveway. Sigh. It’s time to start working toward a new situation.